The perfect combination of high performance together with ease of use allows even the most demanding applications to be tackled easily by the P2 variable frequency drive. 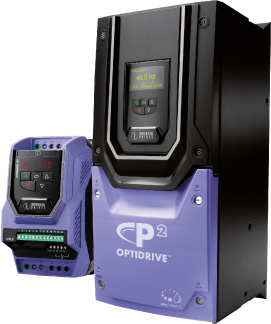 Invertek has developed advanced mathematical algorithms and uses the very latest hardware technology to ensure Optidrive P2 provides exceptional motor control with a simple interface to help users easily apply the benefits to their applications. Designed for fast installation and commissioning, P2 variable frequency drive provides the most cost effective solution for industry. All Optidrive P2 units provide 150% overload for 60 seconds as standard, ensuring each drive is suitable for Heavy Duty applications, whilst the IP55 enclosed versions ensure the drive is tough enough to survive in industrial environments. Extensive I/O and communications interface capabilities ensure the drive can be integrated quickly and efficiently into a wide variety of control systems with the minimum commissioning time, ensuring rapid start up. Invertek's simple parameter structure, and carefully selected factory parameter settings ensure that commissioning time is kept to a minimum.